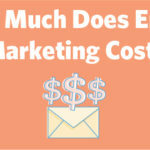 ﻿ How Much Does Email Marketing Cost? » Red Mango Marketing! What is email marketing and why is using it important? Email marketing is simply a form of online marketing, and a way to promote your brand to your audience, through email. The days of fighting over ad space in print or on billboards are over. Today’s fight for audience engagement takes place in the inbox. Because so many consumers are living and shopping online, your online presence is a chance to get in front of those people, who otherwise may have never learned about your business. This is where email marketing provides a unique value to businesses that use it — and there are numbers to prove it. Email marketing is good for your business. In fact, $38-back-for-every-$1-spent kind of good, according to Direct Marketing Association. Don’t worry — you don’t need to be a marketing expert to see these kind of results. Nevertheless, email marketing is extremely affordable and available for small businesses, entrepreneurs, nonprofits, event planners, and anyone else interested in promoting something. Working with an email marketing platform like Constant Contact is the only way your business can leverage email marketing, and other tools like email automation, to effectively deliver messages to large groups of contacts or subscribers, while serving up professional-looking emails. With an email service provider, you’ll benefit from professional email templates; tools to help you grow and manage your email list; and tracking features that show you who’s opening and engaging with your campaigns. Plus, you’re guaranteed delivery rates, so you know your emails are reaching the right people. With Constant Contact email marketing software, you get a free trial for your first 60 days. This is great for businesses just starting out. There’s absolutely no risk and no credit card required. Plus, you get full access to all our email marketing tools, as well as live expert help and online resources. You can cancel at any time, get special discounts if you’re a franchise, nonprofit, or if you prepay for six or twelve months. No commitment or risk necessary. There’s also a money back guarantee if you decide to close your account within 30 days of signing up. Talk about making it easy! After the trial and discounts, you’re monthly cost of email marketing could cost as little as $17 per month. I spend more than that on coffee! Check out our pricing page for more details. If you’re a small business or solo operation, chances are you don’t have a ton of time to add an entirely new marketing platform to your already busy days. Right? Not necessarily. With Constant Contact, anyone can be an email marketer. With our intuitive navigation, you setup your campaign and launch in minutes. Even with the learning curve, our live email experts can walk you through anything that’s giving you trouble. Another great benefit of email marketing is that you can schedule emails to go out as far in advance as you want. This is a time-saving trick that all the best email marketers use to their advantage. You can also set up an automated series of emails to send subscribers on your email list targeted content based on certain actions they take — from purchasing something on your online store to filling out certain signup forms on your website. The point is, great email marketing strategy takes very little time to accomplish, leaving you free to pay attention to the other aspects of running your business. If you paid a dedicated employee, marketing agency, or freelancer to run your email marketing, this could cost anywhere from $15 – $100+ per hour. However, with Constant Contact, you wouldn’t need to hire any extra help, and would be able to run successful email and digital marketing campaigns with resources you already have. We’ll mark this cost down as free. Another big difference between traditional email and email marketing, is that email marketing allows you to bring the element of design into your emails. The benefits of a good design is that it can help with customer engagement and converting emails into sales. For example, you can brand your emails, include pictures of your products or stock photos, or even use fun videos or gifs. Don’t forget: your emails be must be designed to be responsive — also known as “mobile friendly” — which means your emails still look and function great on any device the reader uses. Similar to the last section, many times, companies hire an in-house designer or a freelance designer to build and brand their email templates. This cost can be huge, anywhere from $25 – $150+ per hour. Let’s keep that “free” train rolling and talk about how easy it is for Constant Contact users to build, brand, design, and customize emails. There are also tons of free email templates you can use right in the product. All you have to do is add the text! You do not need to hire a designer or web person to create professional-looking emails that convert. Free? Check! Email templates aren’t the only perk included in Constant Contact. There are also free stock photos for you to use in your email campaigns for no extra charge. Buying stock photos can add up, so this is another cost you can mark as free. How were companies marketing products before email marketing? Ads in print, direct mail, phone calls…remember those? You may still be using some of those channels today. Because of the low upfront cost of email marketing, the return on investment (ROI) from email marketing is higher than, say, direct mail, where you have to pay a designer, a printer, postage, etc. Plus, direct mail takes forever to reach your customers. Sending emails to your email list is instantaneous. Take a look at the oldest channel out there: word-of-mouth. Traditionally, word-of-mouth travels slow. Email travels fast. This mean referrals can happen with the click of a button when your customers forward your emails to friends and family. In fact, Constant Contact user Light Health Research attributes $1.5 million in sales to their email referrals. Let’s look at the cost of email marketing a little differently. Sometimes the question is not how much does email marketing cost — but how much is it costing you by NOT doing it? Considering that 81% of SMB retailers in the US rely on email as the primary customer acquisition channel, if you’re not sending emails, you’re missing out. In fact, on average, B2C marketers who connect with customers through automated emails see conversion rates as high as 50%. Taking advantage of what email marketing has to offer, you get those sales, instead of your competitors. Can you afford to lose that? After all is said and done, it’s safe to say that email marketing more than pays for itself when working with the right email marketing tool. What you get back is worth that small monthly dollar amount. So don’t let the cost deter you from making a great decision for your business. Use email marketing to get your message in front of your audience. There’s really every reason to start today. The post How Much Does Email Marketing Cost? appeared first on Constant Contact Blogs. This entry was posted on Friday, March 29th, 2019 at 3:33 pm	and is filed under Email Marketing, News & Updates. You can follow any responses to this entry through the RSS 2.0 feed. Both comments and pings are currently closed.